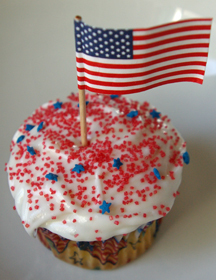 For any summer party, including Fourth of July festivities, consider these easy, somewhat abstract watermelon cupcakes. The “seeds” are chocolate sprinkles! 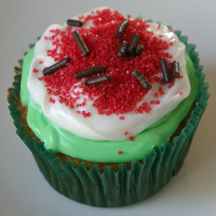 What You Need: 1 cupcake; green cupcake liner; frosting tinted green; white frosting; red sugar sprinkles; chocolate sprinkles. How to Make It: Frost cupcake green. 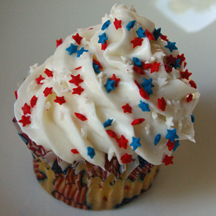 Drop and spread a dollop of white frosting to about half an inch from the edge. Sprinkle with red sugar, almost to edge of white. Add chocolate sprinkles for watermelon seeds. 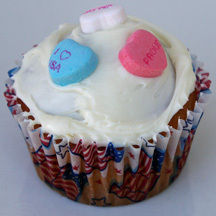 Want to make cupcakes for Fourth of July, Election Day or the Barack Obama or John McCain running mate announcement? Keep it simple with these quick cupcakes. How to Make It: Frost cupcake. 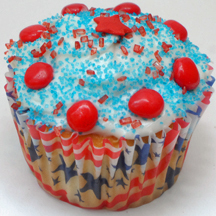 Sprinkle with blue sugar and then a little red sugar. Add star to center and red hots around the perimeter. 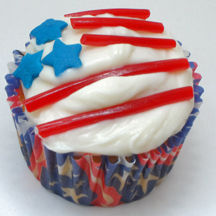 Whether you’re gearing up for the presidential election, celebrating the Fourth of July or just feeling patriotic, these cupcakes are quick and easy, with no pastry bags or “piping” necessary. 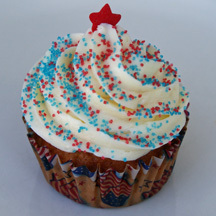 What You Need: 1 cupcake; white frosting; large blue star sprinkles (Wilton makes some); thin red licorice strings; kitchen shears, scissors or knife. How to Make It: Frost cupcake. Cut licorice as shown and arrange in stripes. Add 3 or more star sprinkles. That’s it!